Arrow Staples offer a range of industrial and commercial staple guns and air brad guns to suit any project. As well as their great quality, this leading brand's robust tools are offered at excellent prices. Providing high-quality tools and materials, Arrow Staples is used by professional and DIYer's alike giving a great build quality and hold to their projects. Whether you are needing a handy lightweight tool for projects around the house, or something more powerful yet compact, Arrow Staples have you covered. 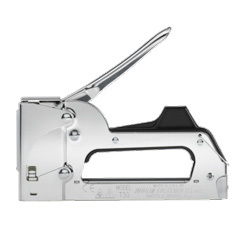 The company offers a range of compact staple guns with the versatility at the heart of every product they make. They also offer wire and cable staple guns for all wire sizes, plier-type guns for stapling at any angle, and heavy duty staple guns, offering powerful performance packed into a simple design. On top of their comprehensive selection of staple guns, Arrow Staples also offers nail guns, hammer trackers and a complete range of quality glue guns to suit any situation. All these products are tested for quality to ensure the best possible finish for your project or work. Your project will be completed in no time with these well-built and robust products from Arrow Staples. Have a question about our staplers range? We are happy to help. Simply click here to send us a message.